"One lady I knew rode to the post office on one of the beach trucks. She was wearing her bathing suit and sat on the truck while others of her party went in for the mail. 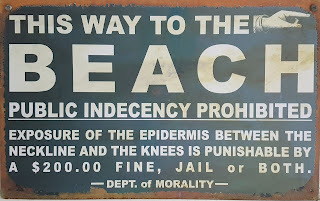 Although the lady was wrapped in a big beach towel over her bathing suit, Mrs. Howard [Ms. Bessie, the postmaster's wife] thought she was dressed improperly, and threatened to pour boiling water on her if she tried to come in." I wonder what Ms. Bessie would think if she could see how some summer folks dress in public today! "In the late 1930s Stanley built the Wahab Village Hotel in hopes of bringing the tourist trade to Ocracoke. "This hotel still stands today as Blackbeard's Lodge. Stanley used one wing of the Wahab Village as a roller skating rink. Another wing was converted into a movie theater." Click here for more information about Stanley Wahab: http://villagecraftsmen.blogspot.com/2013/06/diploma.html. Last week Amy and I were looking for seashells when we spied a strange shape out in the ocean. 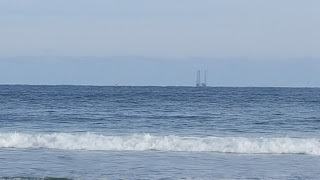 What looked like three tall masts or pilings loomed above the horizon. 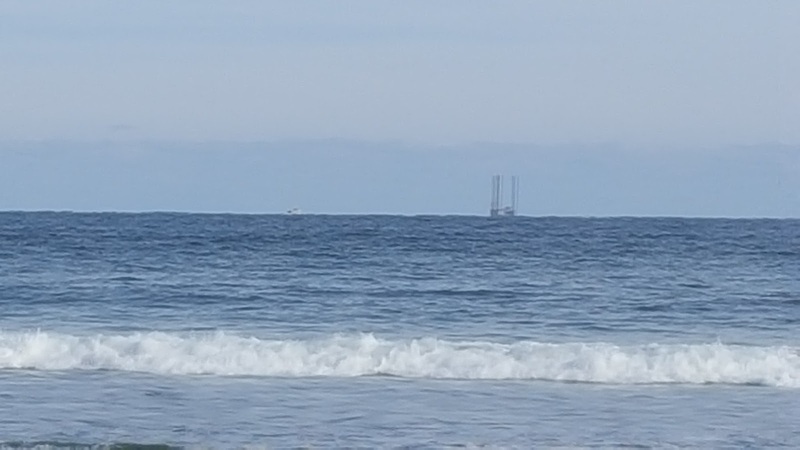 It was clearly not a sailing ship, but it took a few minutes to venture a guess that it was a section of the new Oregon Inlet bridge, now under construction, being towed to the work site. Amy had her binoculars with her, so we took the following photo through the eye piece. The last photo is a cropped close-up. We are not sure this is a structural element of the new bridge, but we think so. At any rate, we'd never before seen anything quite that that out in the ocean. Do Not Feed the Ducks! They are cute...especially the little ones. But they can be a nuisance for home owners and business owners. We are talking about ducks. In recent years hundreds of mallards have taken up permanent residence in Ocracoke village. Although mallards are protected as migratory waterfowl, these critters are in no hurry to go anywhere, at least not as long as people feed them. Feeding them is not good for the ducks...it is not good for residents & visitors...and it is not good for Ocracoke. Feeding the ducks, thereby interrupting their natural migratory instincts, leaves the ducks vulnerable to parasites, disease and death by automobiles. They are much healthier, and live longer, in the wild. "Feeding native ducks is not necessary. They have wings and can fly to find food. Bread and other processed food kills ducks. They die of disease and malnutrition. Lettuce is NOT an appropriate food for ducks. ...A fed duck is a DEAD duck. "Wild ducks need to eat the green foods that grow naturally in their environment in order to maintain good health and a normal lifespan. Their ability to fly and retain natural instincts for survival depends entirely on the foods they eat. By feeding wild (or dumped domestic ducks) you are contributing to their early death, shortening their lives ten-fold. "Ducks can literally starve to death if they are fed bread. Bread has no nutritional value for a duck. It is like a human eating cardboard. It fills them up so they don’t look for real food. They die of malnutrition." For more information, click here: http://outerbanksvoice.com/2016/04/17/ocracoke-group-says-no-to-euthanizing-ducks-crowding-town/. On Saturday, as we were enjoying conversation after our evening meal, Lachlan came running into the house announcing a rainbow forming in the east. David made this panoramic photo to share with our readers. On April 13 I published the following news clipping about Ocracoke native Stanford Jackson (1859-1944). "Ocracoke, July 7. 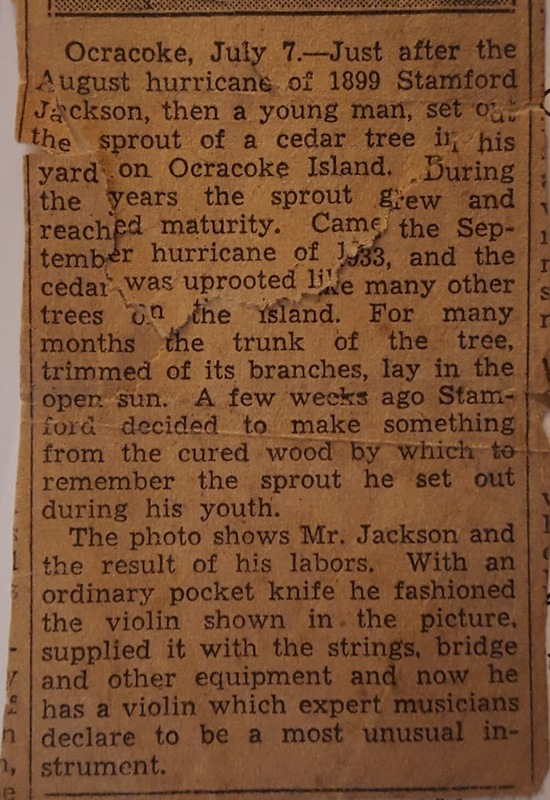 --- Just after the August hurricane of 1899 Stamford [sic] Jackson, then a young man, set out the sprout of a cedar tree in his yard on Ocracoke Island. During the years the sprout grew and reached maturity. Came the September hurricane of 1933, and the cedar was uprooted like many other trees on the island. For many months the trunk of the tree, trimmed of its branches, lay in the open sun. A few weeks ago Stamford decided to make something from the cured wood by which to remember the sprout he set out during his youth. "The photo shows Mr. Jackson and the result of his labors. 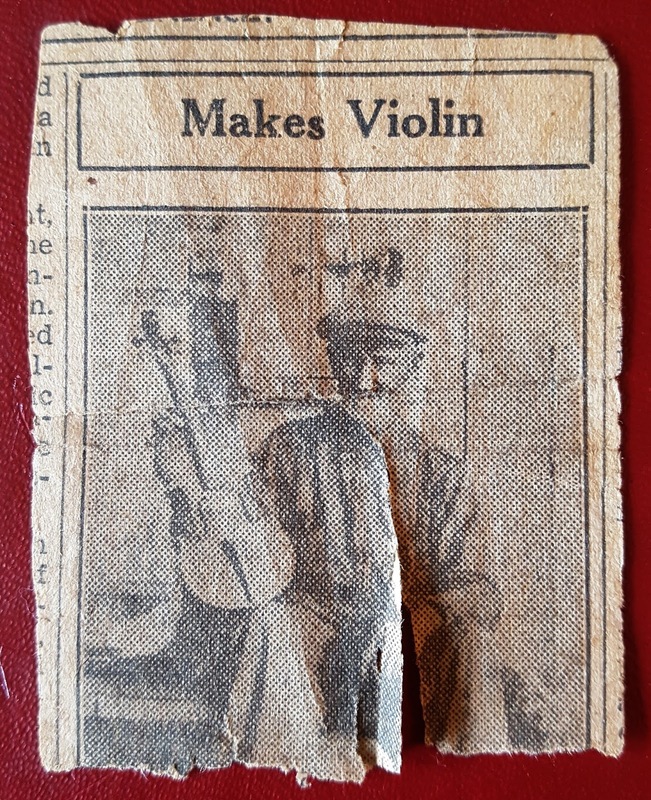 With an ordinary pocket knife he fashioned the violin shown in the picture, supplied it with the strings, bridge and other equipment and now he has a violin which expert musicians declare to be a most unusual instrument." At the time I wrote the April 13 blog post I had just located the photo the prior evening. Chester Lynn found it in a scrapbook, but I hadn't yet made a copy. 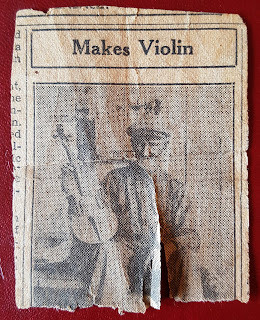 Below is the photo of Stanford Jackson and his violin. This month's Ocracoke Newsletter is a story written in 1968 by Allie (Teenie) Scott. Island resident, Jen Esham, Allie's daughter, shared the story with me. It is a story about Simon Garrish, Jr. (1865-1935) and his United States Life-Saving horse, Sambo. You can read the story here: www.villagecraftsmen.com/news042116.htm. 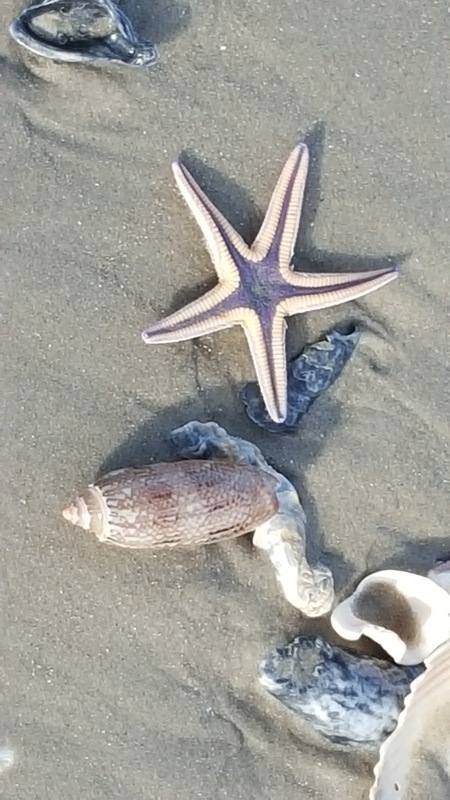 A few days ago I was walking along the beach with Amy when I noticed this purple starfish (Astropecten articulatus, also called the Royal Starfish) that had washed up alongside a beautiful lettered olive (Oliva sayana) shell. 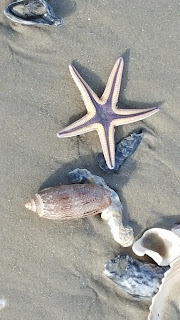 Sometimes starfish wash up on our beach in the hundreds. This time there was only one. When I picked it up I noticed that the tiny tube feet were still undulating. I tossed it back into the surf. Maybe it survived. As mentioned earlier this month, the biennial Portsmouth Island Homecoming is scheduled for Saturday, April 30. Following is an excerpt from an article in the September 27, 1953, News and Observer (Raleigh, NC). "In due time the Civil War descended upon Portsmouth.... Fort Granville, built at Portsmouth in 1753, was fired by the Confederates. The Yankees swarmed over Portsmouth, took possession of the hospital, provisions, cattle and everything else. Old timers today tell that all Portsmouth residents left the island, all except one extremely portly lady, who was too large to be removed from her house -- she just couldn't get through the door. Later, after the Yankee storm had passed and the island residents returned home, the over-sized lady reported the Northern soldiers had treated her kindly." Congratulations to Greg Smith who submitted the winning entry to last week's contest. Greg guessed that the 1951 price of a 1/2 acre lot on Portsmouth Island was $22.50. His guess was the closest to the actual price of $15.99! 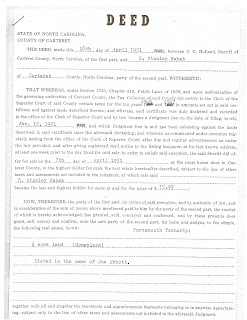 Below is a copy of the original deed. Click on the deed for a larger, easier to read image. For information about how to get an even better quality image please follow the directions on the right, under the icon for OcracokeNavigator.com. Many thanks to all who entered our contest. We will be mailing this hand-crafted pottery bowl by Sunset Hill Stoneware to Greg in the next few days. Lately I have been reading Samuel Taylor Coleridge's epic poem, "The Rime of the Ancient Mariner." I was reminded of this photograph of Mrs. Abner Dixon who began teaching at the school on Portsmouth Island in 1917. "Elsewhere in this edition today is a picture of Mrs. Abner Dixon, teacher of North Carolina's smallest school, half of her student body, and a stuffed Albatross.... [T]he moth-eaten stuffed bird...at first appeared to be a gigantic sea gull. Interested we asked Mrs. Dixon about the bird, learned it was an albatross, and then wanted to know the story of how this gigantic seabird, native of Antarctic, happened to be at Portsmouth, so she told us this story. "'Years ago a group of sportsmen arriving at Tom Bragg's for the duck and geese shooting, received as a joke from some friends who could not come along, the stuffed Albatross. They knew that...a live Albatross is an omen of good luck and that a dead one was an omen of bad luck. Whether the stuffed bird brought bad hunting luck to the party is not remembered. "Then we asked Mrs. Dixon how many students she had enrolled when she first came to Portsmouth. 'About 35' was her reply. 'And how many did you have 10 years ago,' we asked. 'Fifteen or 20,' she added. 'And today you have only four pupils?' we asked. Her reply was in the affirmative." From the fiends that plague thee thus. Telephones came to Ocracoke in 1956. In 2014 I published an Ocracoke Newsletter about telephones: http://www.villagecraftsmen.com/news022114.htm. In the article, I wrote, "When I was a youngster there was only one telephone on the island -- at the Coast Guard station. According to cousin Blanche the US Coast Guard had a ship-to-shore radio telephone as long as she can remember, probably from the time of the construction of the village station in 1905." I recently came across a transcript of part of a US Coast Guard log about calls made from the station's telephone during four days in February, 1941. Calls included several to Bells Drug Store in Beaufort, NC, "in regards to medicine," one to the Fisheries Commission "in regards to [an officer's] patrol," one to Atlantic, NC, "in regards to fish," one to City Grocery in Beaufort, NC, "relative to groceries," and one to Betts Bakery in Beaufort, NC, "relative to buying bread [for Clarence Scarborough's island grocery store]." One incoming call from the Commander of the Norfolk District directed the Ocracoke Station to be on the lookout for a "possible thief" flying an airplane. Another incoming call to Mrs. George F. O'Neal from W. M. Hodges said simply, "Meet me at Atlantic Monday if I am not there wait until I get there." What a difference from today's instant communication! 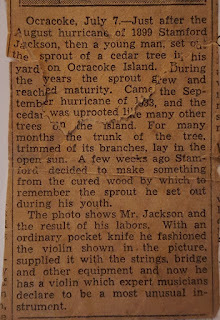 Chester Lynn recently shared the following undated news clipping about Ocracoke Native Stanford Jackson (1859-1944). "In 1940 Mr. Stanford Jackson, an octogenarian island carpenter and recent convert, offered to build the new [Assembly of God] church if the materials could be procured and several helpers found. 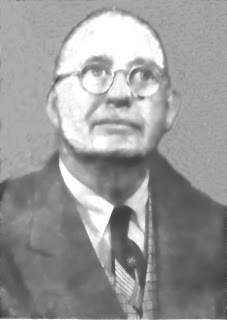 Eliza O'Neal's sons, John Thomas, and his bother, Steve, and several others volunteered their time.Construction was begun in 1941 and continued into 1942. Sanford Jackson built the first pews as well. "An article in the Ocracoke Beacon, dated October 15, 1941, recalls, 'Stanford Jackson, expert craftsman, who can make anything from a fiddle to a ship model, with his pocket knife, is now completing a much bigger job. For several months, Stanford has been engaged (almost single-handed) in building the little church down on the Point Road which will be the place of worship for islanders of the Holiness Pentecostal faith. ; The church is almost completed, and Stanford Jackson deserves praise for the fine job of carpentering he has done in building this place of worship.'" In 2011 Kathy and Bob Phillips purchased their island house and completed a restoration project. The house was featured in an article on the Ocracoke Current. Irvin was born April 20, 1916, and died in 1997. On Saturday, April 16, Bob & Kathy Phillips will be remembering Irvin by celebrating the 100th anniversary of his birth. You are invited to come to their home on Howard Street to remember Irvin and his many contributions to our community. 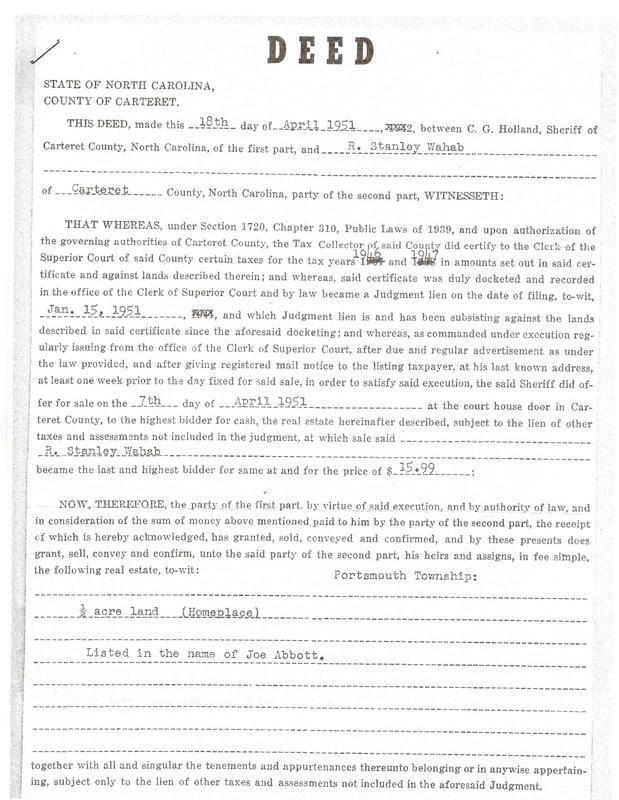 I recently came across a document that recorded an April 8, 1951, sheriff's sale of a 1/2 acre parcel of land in Portsmouth village, just across Ocracoke Inlet. I am wondering if any of our readers can guess how much the bidder paid for the land. If you think you know (or have an educated guess), send us an email at info@villagecraftsmen.com (put "Sheriff's Sale" in the subject line) and fill in the blank in this sentence in the body of the email: "The purchase price of the land was $ ________." The entry that comes closest to the actual amount will win one 5" hand-crafted pottery bowl by Sunset Hill Stoneware (retail value, $24.00). 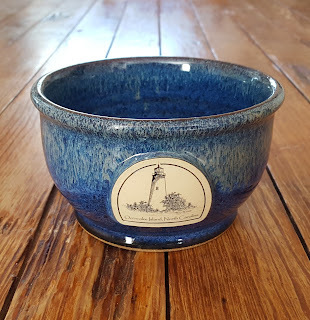 The bowl includes a "medallion" depicting the Ocracoke Lighthouse, created by Philip Howard, owner of Village Craftsmen. Entries dated after 12 noon, April 15, 2016, will not be accepted. Winner will be announced on this blog April 18, 2016. A copy of the 1951 deed will be posted. Please, one entry per email address (in case of multiple entries from the same email address, only the earliest dated email will be considered). The bowl will be shipped to any address in the United States of America chosen by the winner. In case of a tie, one winner will be chosen at random from the winning entries. Of course, employees of Village Craftsmen, and their immediate families, are not eligible to win. Ocracoke Island's Fifth Annual 10K/5K and One Mile Family Fun Run will be held Saturday, April 23, starting at 8 a.m.
A new event this year is Ocracoke's First Annual Half Marathon. This will be held Sunday, April 24, also starting at 8 a.m. 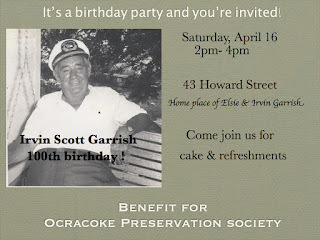 These events are benefits for several Ocracoke Island organizations including the Ocracoke Community Park, Ocracoke School Boosters Club, Ocracoke Community Radio, and Ocracoke Child Care. So far, almost $100,000 has been raised since 2012. For more information and to register for the races please visit the official web site: http://www.ocracokeisland5krun.org/index.asp. 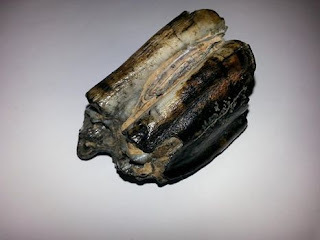 After reading Tuesday's post about Native American pipes & pipe bowls and fossilized bison teeth (all found in the waters near Ocracoke) a reader sent me this photo of items he found in the same areas. We think these items are whalebone. The bottom artifact appears to be some sort of tool made from whalebone. In August of last year we published an article about Whale and Porpoise Fishing on the Outer Banks. It is a fascinating story that is not well known. It is not too late to make plans for the upcoming biennial Portsmouth Island Homecoming. This year's Homecoming is scheduled for Saturday, April 30. Not only is this the 50th Anniversary of Cape Lookout National Seashore and the 100th Anniversary of the National Park Service, but the Friends of Portsmouth Island, those wonderful people who plan this event, will be celebrating “The Families of Portsmouth." A special Descendant Tent will be set up for Portsmouth families to gather and share their photographs, family trees, scrapbooks, and memories. The Post Office will again be open to stamp your mail from Portsmouth. Portsmouth Island Homecoming has been a tradition since 1992. Portsmouth Village was established in 1753 as a transfer and storage site for goods passing through Ocracoke Inlet. At one time Portsmouth was larger than Ocracoke. However, by the 1950s the population had declined to fewer than 20. The last two remaining residents left the island in 1971. Reservations for the trip from Ocracoke to Portsmouth should be made by calling Rudy Austin: 252-928-4361. The cost of the ride to Portsmouth is $20 per person round trip. For more information please visit the Friends of Portsmouth Island web site. 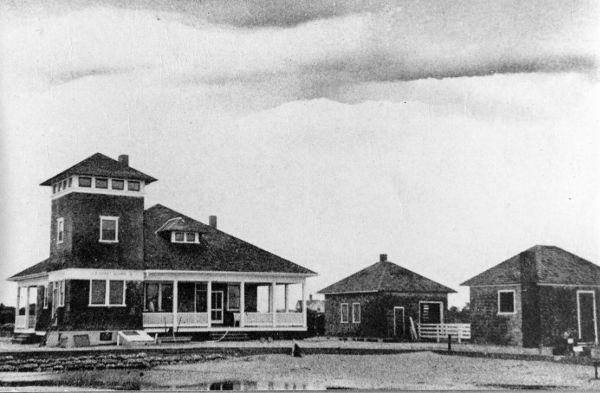 You can read a first-time visitor's story of Portsmouth Island here: http://www.villagecraftsmen.com/news042115.htm. A lot of fascinating activities were going on on Ocracoke Island before the first Europeans arrived. If only we knew more! If you have known Ocracoke for many years you know there are many O'Neals who live on the island. 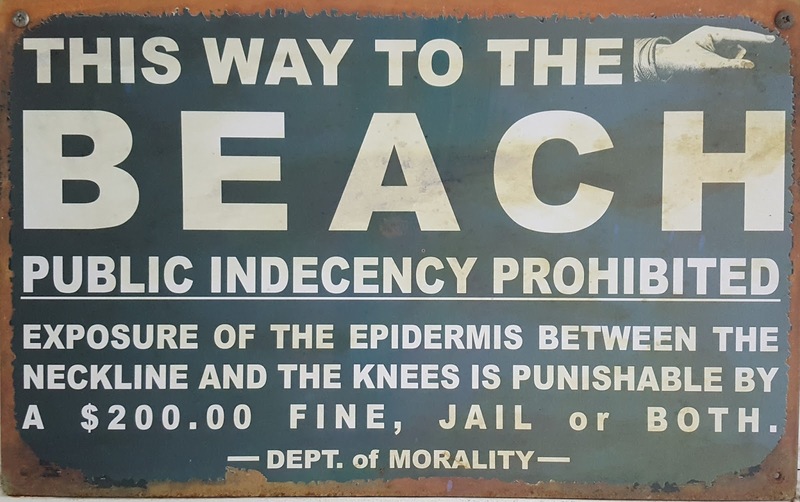 This is, in large measure, because of Harry [1901-1977] and Essie [1915-1999] O'Neal. They had eleven sons. In 1997 Christine Rucker of the Winston-Salem Journal wrote an article about Ocracoke. She interviewed Essie O'Neal, and included her brief account of the 1944 hurricane (Essie was 8 months pregnant with their fifth child when she and Harry loaded their four children into a boat as their house was flooding): "We floated down the street to [Harry's] sister's house, and floated over their fence posts and into her kitchen, and we all waited the storm out together." Later in the article Rucker reports that Essie, in addition to washing clothes for her big family, made three meals a day, including 52 biscuits with each meal. The Ocracoke Preservation Society has a display in the main hallway documenting the Ocracoke O'Neal family. Be sure to take a look when you are down that way. It is scheduled to be replaced sometime later this year. Imagine islanders' surprise early this morning when they came down to Silver Lake! 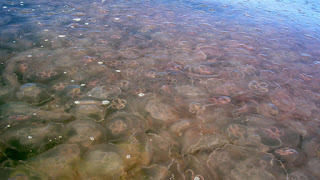 The harbor was teeming with tens of thousands of jellyfish. The jellyfish were so thick that fishing boats were disabled when water intake openings on outboard motors became clogged with the gelatinous critters. The "Invasion of the Jellyfish," as locals are calling this event, extends several miles into Pamlico Sound. Creative entrepreneurs have already begun thinking of ways to turn the jellyfish into tourist dollars. According to Wikipedia, " Some species of jellyfish are edible for human consumption and are used as a source of food and as an ingredient in various dishes. Edible jellyfish is a seafood that is harvested and consumed in several Asian and Southeast Asian countries, and in some Asian countries it is considered to be a delicacy. Edible jellyfish is often processed into a dried product. Several types of foods and dishes may be prepared with edible jellyfish, including salads, sushi, noodles, main courses, and even ice cream." Click here for more information on jellyfish and jellyfish invasions.